The Hawaiian language includes over 200 words for rain with a subset of names specific to a place. Hawaiian rain names recognize that what falls from the sky can be delicate (lilinoe, kili, uaoa); windblown (lelehuna); showery ( a naulu); cold (kili hau or ua ‘awa); or rainbow-hued (uakoko). The reddish ‘ulalena rain falls on Haiku. Uakea mists Hana. Winds can also be place-specific: the akipohe wind nips Waihee; the imihau wind brings storms to Lahaina. The language of Hawaii reflects the deep relationship between people and nature. The original naturalists and resource stewards of Hawaii — Hawaiians — have a keen understanding of their surroundings, from the terrain and weather to local plants and animals. This understanding is also reflected in place names. Haliimaile translates to the blanket of the maile vine. Kanaio recalls the shrubby naio trees that once dominated the forests of the area. Understanding of place was essential to the survival of the first island residents. And yet today, with the distractions of modern life, it’s easy to forget that relationship to nature can enhance our well-being and the health of the environment. Recent research on the Japanese practice of shirin-yoku, or “forest bathing,” has demonstrated the health benefits of intentional time in nature. Observing the natural world elevates immune response and lowers blood pressure and stress levels. Forest bathing began in Japan in the mid-1980s and is now an integral preventative health activity there. Interest has spread to the United States, with forest bathing clubs forming in urban areas. Forest bathing is not hiking, nor does it have to take place in a forest. Practitioners go out into nature to experience, with all senses, their surroundings — the range of colors, the scents and sounds in the air, the feeling of sun or breeze on their skin. Essentially, tuning into nature as a naturalist would. Forest and Kim Starr, early detection specialists with the University of Hawaii, are self-taught botanists, entomologists and ornithologists. They often conduct inventories of a defined area, identifying the species of plants, birds, animals, spiders, snails, and insects present. “When we are out there, we’re using all our senses,” says Kim. Cued in to bird calls while simultaneously scanning for the next plant species to add to the list, the Starrs are intently focusing on their surroundings. They often return to the same place repeatedly, documenting changes. Their efforts help resource managers find invasive species before they are widespread and causing harm in the environment. What the Starrs do — tune into the world around them and note the changes — can be done by anyone. Like forest bathing and Hawaiian practice, it simply requires paying attention to our surroundings and being curious. Training is not necessary, but repetition enhances the experience, both in better understanding what belongs and does not belong in the area and achieving the health-related benefits. Spend time outside, it’s good for your health and Hawaii. Learn more about the names of the winds and rains near your home, visit www.webquest.hawaii.edu/kahihi/webquests/topical/energy/SC6.6.2wind/extras/HawaiiWind&Rain.pdf. Discover a forest bathing practice of your own — find resources and information at www.natureandforesttherapy.org. As you deepen your connection with the natural world, you can help protect Hawaii from newly arrived pests; report changes in your surrounding from potentially invasive species to www.643PEST.org. * Lissa Strohecker is the public relations and education specialist for the Maui Invasive Species Committee. She holds a biological sciences degree from Montana State University. 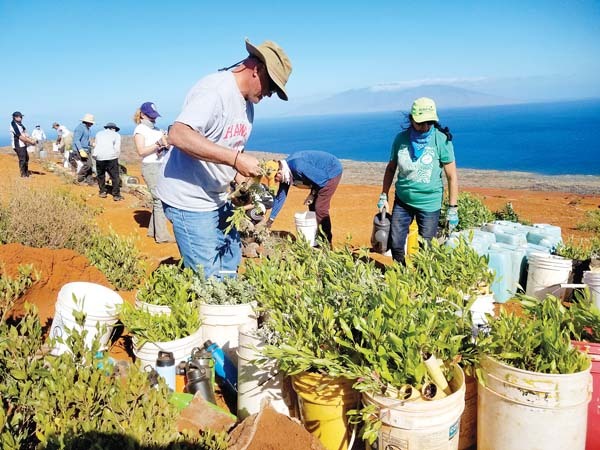 Kia’i Moku, “Guarding the Island,” is prepared by the Maui Invasive Species Committee to provide information on protecting the island from invasive plants and animals that can threaten the island’s environment, economy and quality of life.